Learning the various facts about wolves is a great way to stop the misconceptions about them out there. Here are some fabulous facts that will help you to understand them in a new light. Wolves very seldom ever attack humans, but there are definitely lots of stories out there about them and humans in the wild. The alpha male and beta female are generally the only two in a pack of wolves that will mate. They are the leaders of the pack. The entire pack of wolves is responsible for the care of the young. They are born in dens to their mothers and will stay there for the first four weeks of life. The pups only weigh about one pound each at birth. The average life span of a wolf in the wild is from 6 to 13 years. In captivity they can live up to 16-20 years. The home range for a pack of wolves can be from 33 to 6,200 km2. They can run up to 35 miles per hour for short periods of time. This can be up to 20 minutes. Most of the time though they are found to move at a slow pace of about 5 miles per hour. There are 42 teeth in the mouth of a full grown wolf. They Indians saw the wolf as a very powerful animal and one they had a great deal of respect for. Wolves shed their coats just like other canines. Generally this will occur in the spring time when the temperatures are warmer and they don’t need it to be as thick. A wolf has a sense of smell well developed. Wolves live in packs that can have from 12 to 40 members in them. They have a very complicated level of social ranking. There is a separate ranking for the males than for the females of a given pack. The wolf uses its tail in the winter time to help keep them warm. Approximately 1/3 of the life of a wolf will be spend moving around their home range territory. They can roam up to 125 miles in a given day to look for food. Some people find a wolf as a pet is a great way to have something exotic. They find them to be fun as pups but it is very hard to domesticate a wolf. They will always have their wild instincts in them. 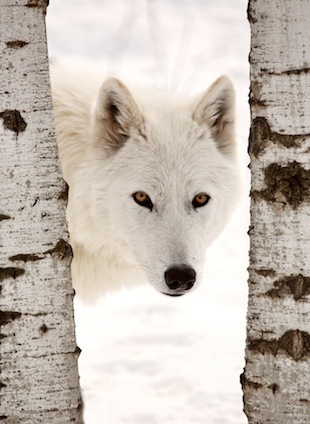 During the winter months, wolves can be found moving around during the day. The rest of the year they are nocturnal. There are some lone wolves out there that live alone. They don’t scent mark or howl though. They live off of very small animals such as rodents due to the fact that they have to hunt on their own. When a pair of wolves mate, they will continue to be a pair until one of them dies. In many instances the pair will have many years together, offering a litter of young for several years. Young wolves are ready to go on hunts with the adults when they are about three months old. Generally they won’t be involved with the take down of the prey at that age. It is mostly a learning process for them to observe.